As the use of e-cigs increases, the availability of places to use them reduces. Today we are going to discuss do’s and don’ts of transporting e-cigs, flight regulations and vaping in certain jurisdictions. While smoking cigarettes is legal in practically every country, vaping most certainly is not. This may seem paradoxical, however the likelihood is if tobacco cigarettes were introduced today they would almost certainly be banned in most places. In much of South America, vaping is illegal, in some cases even owning vaping paraphernalia is against the law, with the potential punishment being as severe as years in jail. South American jails are not a place even the most hardened of criminals would feel comfortable, so if you are travelling to any of the countries in the image above, please brush up on local laws. Taking them there in the first place can be tricky, different airlines operate varying internal rules. The general rules however prohibit carrying more than 100ml of liquid, and this must be bagged up in a clear container if carried in hand luggage. Many do not allow the carriage of the e-cig and the battery together as this may present a fire hazard. In all fairness, although these instances are rare, it can happen, and the last thing anybody wants on a plane is a fire and an explosion. As responsible, respectful vapers it is certainly good practice to keep the battery separate from the e-cig, but on a personal level worth keeping both in the hand luggage for easy access once departing the airport to get your fix. This may also be dependent on the specific battery, some airlines require lithium ion batteries to be stored in the main hold, not hand luggage. Additionally, should a fire or any damage occur, there may be personal legal and financial implications. Although the duty of care to passengers rests with the airline, and bag scans are undertaken by airport security, you are to self declare that there are no hazardous materials in your baggage, which in major cases could lead to charges inclusive of negligence and recklessness. 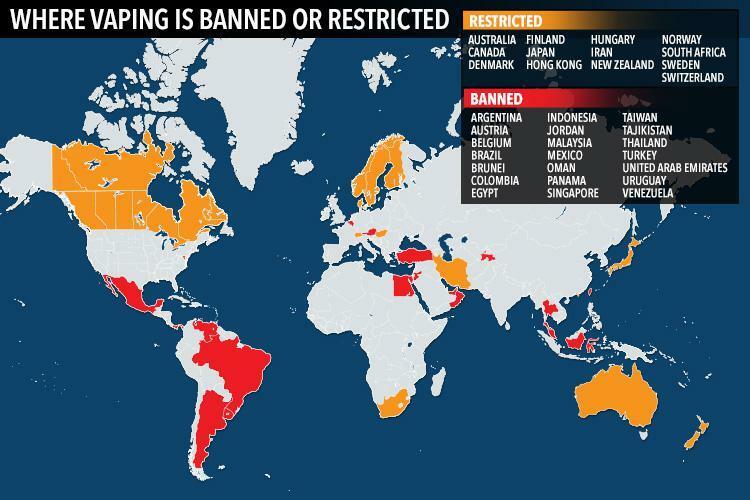 Looking at the list of countries that have banned vaping or where heavy restrictions are placed, we should feel ourselves lucky that such restrictions are not imposed here. Whilst researching as to why some countries have banned e-cigs, I found it quite amusing that many were under recommendations by the World Health Organisation (WHO) in a report commissioned in 2014. 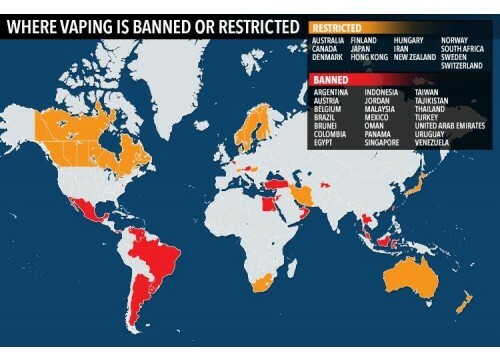 It is worth noting that the majority of countries where vaping is illegal are considered to be “3rd world”, “2nd world” or newly-Industrialised countries (NICs). These countries struggle to raise tax revenue, and cigarettes are (despite being far far cheaper than much of the EU and North America) good sources of revenue. Interestingly, so are fines for the swathe of banned products in these countries, the overcharging of tourists, and cuts of bribes handed to officialdom. The WHO report itself confirmed that e-cigarettes are less toxic than cigarettes. Therefore this was quite clearly in my mind a convenient excuse for the truth I am hinting at here. This is moreso considering the large majority of developed “1st world” nations have not adopted a similar practice. Be vigilant, be aware. Then again, looking at our Summer sun, why would you want to vape anywhere else? !